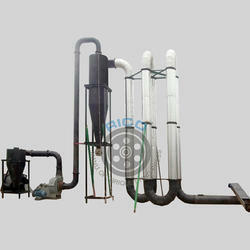 Flash Air Dryer is used to dry moisture raw material. If raw material moisture content is higher than 25mm then we cannot feed raw material into briquette plant. Flash air dryer through raw material is dried and ready to enter into briquetting machine. Entered raw material compressed under high pressure of 300C and absorbed all moisture from material. Now it is ready to enter in briquetting machine.